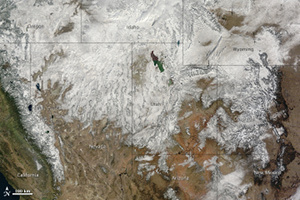 Satellite image of the western United States, taken on Thanksgiving Day. Image: NASA.This Thanksgiving weekend, Bay Area skiers had a lot to be thankful for–ski resorts in the Lake Tahoe area received over 170 inches of snow throughout the weekend. But heavy snow and rain are not expected to continue in the Bay Area, because the world is experiencing a La Niña. Sea surface temperature anomalies on November 25, 2010. The equatorial Pacific is cooler than usual (note the blue color), a characteristic of a La Nina event. Image: NOAA.La Niña also affects air temperature. During a La Niña, the South is typically warmer, while Southern California and the Pacific Northwest are cooler. You can see climate predictions for the next three months, from the National Weather Service Climate Prediction Center. 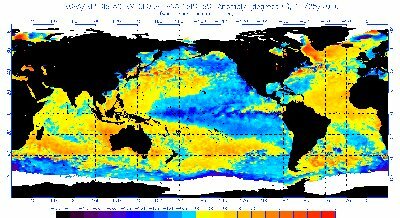 A La Niña is basically the opposite of an El Niño. El Niños are characterized by warmer-than-average sea surface temperatures in the equatorial Pacific. This happens when the atmospheric pressure system gets a bit out of whack. Usually there is high pressure over the Pacific Ocean and low pressure over the Indian Ocean—picture a see-saw anchored over New Zealand, with the heavy kid sitting on the end over Indonesia. For reasons we don’t quite understand, sometimes the see-saw tilts the other way—now the heavy kid is sitting in the southeastern Pacific, and the kid on the Indonesian side is way up in the air. This swap in atmospheric pressure has quite a few consequences. The trade winds (which typically blow across the Pacific from the east to the west) get weaker. The water that the trade winds usually push westward instead piles up and moves east. This water is warm, and it evaporates, causing more rainfall along the west coast of South America. Meanwhile, places like Indonesia and Australia get less rainfall, along with drought and fire. The weakening of the trade winds and westward flow of ocean currents in the Pacific has a second effect. Under non-El Niño circumstances, the trade winds carry the top layer of water to the west, and so water from deeper in the ocean moves up to take its place. This is called upwelling. The water from deep in the ocean is cold and full of nutrients, and it drives the fisheries along the coast of Chile and Peru. Without the trade winds and the upwelling, fisheries crash. A strong El Niño has big economic impacts, not all of which are negative; some agricultural areas are benefited by the extra rainfall, and people in places with unusually warm weather can save on heating bills. Of course, La Niña events have economic impacts too. As scientists learn more about predicting the climate during El Niños and La Niñas, we can plan accordingly and mitigate the economic impacts of these events. My comment about planning your ski vacation according to this year’s La Niña was a little bit serious! Rainfall predictions based on El Niño and La Niña models can help farmers decide which crops to plant. And, here in drought-prone California, La Niña precipitation predictions are influencing water allocation decisions for the coming year.